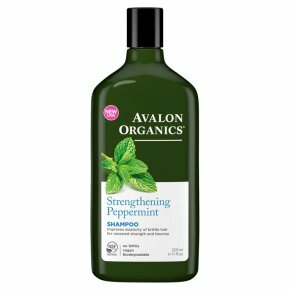 Gentle plant-derived cleansers enriched with Babassu Oil, Vitamin E, Wheat Protein, Calendula and Peppermint thoroughly cleanse while repairing elasticity to help prevent breakage for strong, smooth, healthy-looking hair. Apply to wet hair, massage into rich lather, rinse. For best results, follow with Peppermint Strengthening Conditioner. For external use only. Avoid contact with eyes.<br>Keep out of reach of children.